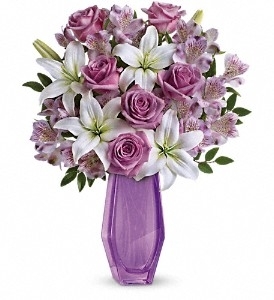 Say Happy Mother's Day with shades of lavender elegantly arranged in an exclusive chic lavender glass vase. It's a beautiful way to celebrate Mom.Lavender roses, white asiatic lilies and lavender alstroemeria are accented with assorted greenery. Delivered in a Lavender Beauty vase.